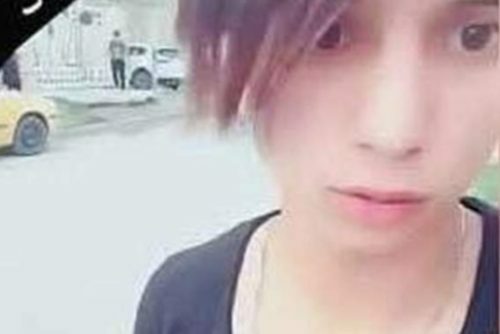 A video being shared on Iraqi social media shows a teen boy dying while his attackers call him homophobic slurs. Hamoudi al-Mutairi was on his way home in the Yarmouk neighborhood of Baghdad. Local media reports that he was caught by someone who then started stabbing him. In a video that was shared on social media, the teen can be seen lying on his side, covered in blood. The boy asks the attacker where all the blood is coming from. “Your guts are out,” the man responds, laughing. The boy says, “I want my mom,” toward the end of the video before being taken to a hospital. Official sources have not confirmed any of the details of the crime, and it is still unclear who shared the video online. Hamoudi was popular on Instagram. He was known for his pictures that defied gender stereotypes, which people are posting to social media to bring attention to the brutal murder and to condemn the violence. #حمّودي_المطيري is trending in Arabic because a 14 year old Iraqi Boy named Hamodi Al-Motteri was tortured and killed because people suspected he was gay and the video is being shared on shared on Social media by his killer. طفل مواليد ٢٠٠٣ يقتل ويصورون قتله فيديو وتعذيبه باخراج احشائه من بطنه لأنه مثلي ! While homosexuality is technically legal in Iraq, courts sometimes condemn people for being gay. Iraq is one of eight countries listed by Amnesty International as having the death penalty for homosexuality.